I don’t want this blog to be a rambling memoir (although it definitely rambles!) of a midlife writer, but here’s a thing from my past. We lived in half the 3rd floor of this large house. I liked the bay window. This is a recent photo from Google. Don’t you just love being able to find pictures of places? I woke up thinking about a church we went to in 1985 when we lived in Vermont. 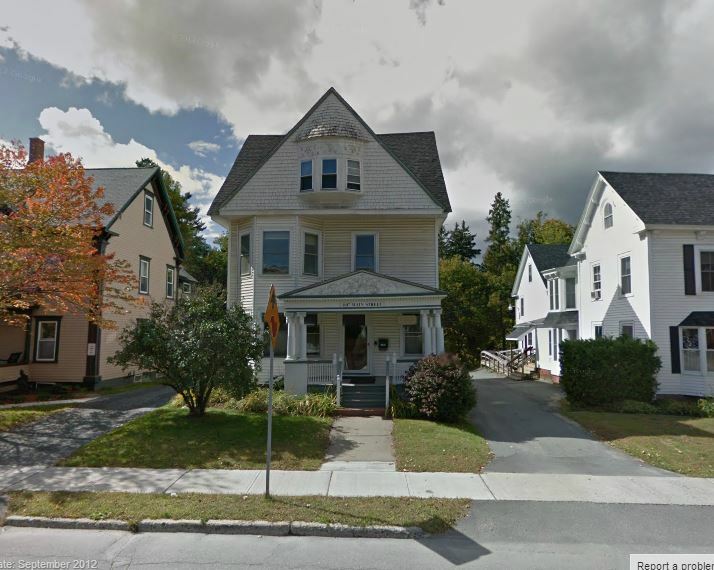 St. Johnsbury, VT was our home from August until a few days before Thanksgiving that year. We were house parents at a group home for developmentally delayed (although the term was still ‘retarded’ back then) teens. My husband was the house manager, and I was his sidekick and helped out. We had just our daughter then, but our son was conceived there. * After our car loan, my student loan and our share of the electricity was paid, we had $10 left from our pay. Out treat was donuts and coffee at a little shop, once a month. Keith was on duty almost all the time. The resident kids went off to a day program so after we helped dress and feed them, we had the morning off until he was put in charge of a guy who was too old for the day program but had no place else to go but stay home. We lived in the third floor, and Keith was on call 3 or 4 nights a week. And there was always a call. The group home had the name Dayspring in it somewhere and was a branch of a ministry that included a Christian school and a farm in Linden and a director who was a borderline megalomaniac. At least that’s how I saw him. We’d only been married just over 18 months when we ventured away from our beginnings in Maine. Keith talked to this guy about cutting back some hours so he had some decent family time, because that is after all, a Christian value. The guy accused Keith of not loving Jesus enough. We were like, “Whoa.” If anybody loved Jesus, it was Keith. Even looking on the map now, St. Johnsbury seems like a pretty churchy town. We lived across the street from the First Congregational Church. Every town in New England worth it’s clapboard has a congregational church. And there were a bunch of other mainline churches but as evangelicals, we didn’t give them any thought. We checked out a few others and the one we landed at was a few scenic miles out of town, Passumpic Community Baptist Church, I believe. The pastor had worked part-time where we were, and another young couple, Bruce and his wife and kids, who worked there went to that church. So it was our home church for about 4 weeks. I believe this is Steve Jewett and his wife, whose name I forget. Funny. I never expected to find his name and even a picture. 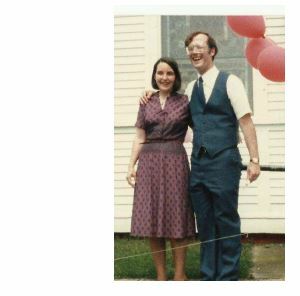 The church’s historical document said he was called to another church in Vermont in the spring of 1986. I looked up the church, and it has a history document. I’m pretty sure the pastor was Steve Jewett, or at least that’s what I’ll call him here. He and his wife were in their mid-thirties maybe, older than us, but not too old to have young children. I think their Sarah Elizabeth was six. Ours was eighteen months. They lived in the parsonage right next door. The church nursery was in the parsonage as were several Sunday School classes. It seems to me there was some kind of work being done on the parsonage at that time, too. Before service, Steve ran through his sermon for those working in classes. Despite our short time there, we did nursery one week. One Sunday after service, we stayed for lunch with the Jewetts. Many Christians are kind of in awe of their pastors, but this couple was real. And I think Steve had some kind of ax to grind with the ministry we were working with. We told him what was said to Keith about not loving Jesus enough because he wanted time to be a husband and father. Steve said, “Run. The place will eat you up.” He seemed to think the ministry had been a saving grace for the director at one point in his life, and he expected it to be that for everyone. We talked to Bruce who was living in a small apartment with his family because that’s all they could afford. Bruce felt trapped. There were not other jobs around. We already felt trapped after a few months. We took Steve’s advice, resigned and moved to Pennsylvania. Honestly, the ministry gave me a bit of the spiritual heebee-jeebees. Maybe it was the control issue and the creepy church that met in a barn that it had that we went to once and never went back to. I didn’t give it much thought over the years because we were busy and got sucked into another church before we were in Pennsylvania even a month. So, what’s the take away? Well, if you call yourself a ministry you can pay your employees squat. I mean, I think we made $250 a month, the both of us plus room and board. And this fits into my spiritual journey somehow. Maybe unlike Steve Jewett and his wife who lived their ministry 24/7 house and all, Keith and I learned we weren’t willing to do that, at least not in that context. Steve confirmed what we believed we should do. *This summer, while driving around and talking with our son, I finally put together both our kids were conceived in residents for developmentally delayed folks. I found that extremely funny, for some reason.